Defender Stephen O’Donnell has been through the ups and downs at Institute in his four seasons with the club and he believes the current squad is good enough to win the Championship. After just missing out on promotion only a number of weeks ago, O’Donnell is determined to put things right this campaign. “I think from being through a league winning team and then also playing in a side which was relegated and I have been able to see the difference in how important a good team spirit is” he said. “The season we won the First Division the spirit was excellent, there was a lot of boys who were digging in for each other and we had a lot of quality players. The ex-QPR trainee like his teams can’t wait for the action to get underway and that stoppage time heartache at Ballinamallard United in June is something of a motivational tool. “We have had a good pre-season, it has been hard and it has been short and rightly so, the manager has planned that because of the way last season finished, but the boys are absolutely bouncing in the door to training every night and they just can’t wait to get this league campaign up and running. “We obviously start with a tough run of games so picking up points will be very important but I think with the quality we have in the squad and no disrespect to anyone else in the league, but we have some of the best players outside of the Premier League, so I think we are well equipped to go ahead and try to win this league. The 24-year-old concedes that trying to win the Championship league has been talked about and trying to make sure they avoid another play-off. “Aiming for the title has been spoken about a few times at the start of pre-season and although last year was a wonderful season in terms of winning the Intermediate Cup, at Windsor Park and the form that we showed since Christmas onwards, but at the end of the day it wasn’t good enough,” he stated. 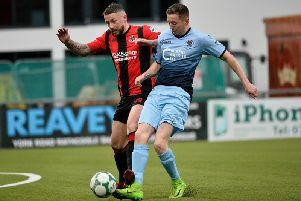 With Donegal native Shane McGinty now departed for Ballinamallard United, O’Donnell believes that midfielder Niall Grace could be the man to replace last season’s top scorer. “Yes Shane leaving will be a loss to us, but what I seen in pre-season I think we fingers crossed with have enough cover,” he added.